If you need to use your PCMCIA card, but your new computer or laptop lacks a PCMCIA adapter, use our usb2pcmcia card to convert your USB port into a virtual PCMCIA adapter. 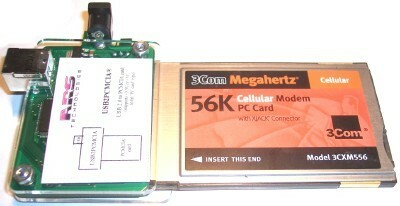 16-bit ’PC Card’ type PCMCIA card. This can be any standard or custom 16-bit PCMCIA card (Type I, II, or III). 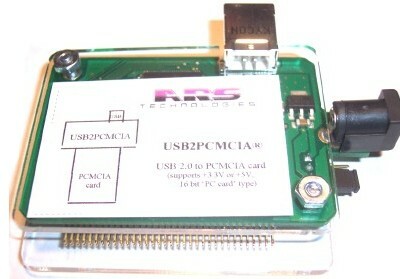 The USB2PCMCIA-R does not support 32-bit ’Card Bus’ PCMCIA cards. The usb2pcmcia-r offers simple migration from PCMCIA form factor to USB; full access to memory and I/O space of the PCMCIA card; and handling of IRQ events. The usb2isa software includes UNIVERSAL SOFTWARE LAYER feature. The ARS Technologies software developers kit, SDKBUS ,is available for converting the software of the PCMCIA card to work on USB, if needed. Color: The usb2pcmcia comes in a clear plastic box. Our engineers have re-designed the clear enclosure for the USB2PCMCIA-R so that it is more stable. Do you need the sdkbus? The SDKBUS is for developers. Otherwise, our hardware comes with all the software and drivers you will need. For more details on the software, please read SDKBUS OR WILL THE USL DO?.